This log cabin was built about 1835 in the Missouri River floodplains. Soon after 1835 cholera occurred at lower elevations, and the cabin was moved to the upper plateau. In about 1850 it was moved to this location, where it was used as a residence until 1954. The original cabin was built as an one-and-one-half-story structure with a dirt floor and fireplace. There was a bedroom in the attic or loft. The exterior walls were constructed of hand-hewn cottonwood logs, originally packed with mud but now sealed with grout. A kitchen and pantry were added to the east side in 1906; the basement was added and the main floor restoration was completed in 1972. The hackberry tree in the front yard has been recognized by Nebraska authorities as one of the largest of this variety in the United States. The log cabin was furnished as a pioneer residence more than 100 years ago. It was restored to near-original condition as a memorial to the living conditions of the pioneers by the Sarpy County Historical Society. On October 16, 1970, this property was entered on the National Register of Historic Places. 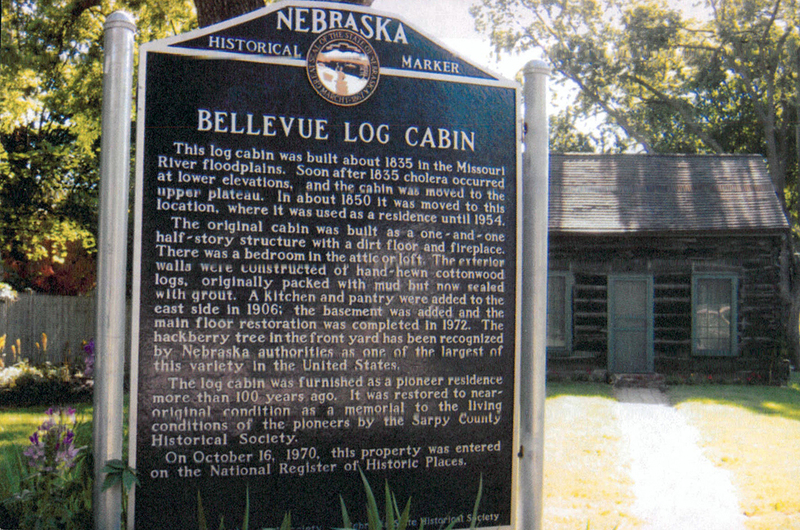 “Bellevue Log Cabin,” Explore Nebraska History, accessed April 19, 2019, https://mynehistory.com/items/show/448.